Having kicked off my new Classic Children's/YA feature last week, I was keen to get other people involved as soon as possible. I was thrilled when awesome author Andy Robb, who writes the brilliant Geekhood books, offered to be my first guest poster on the feature! He's here to tell us about a fantasy trilogy which I'd never heard of before but which sounds fascinating. Number of books: Three; it’s your good old classic fantasy trilogy, starting with The Summer Tree, going through The Wandering Fire and winding up with The Darkest Road. I read the trilogy one summer in 1986, when I was doing a lot of train journeys from Devon to Yorkshire and back again. Availability: I checked on the Waterstones website and they’re still out there. Which isn’t bad for a bunch of books that were published in the ‘80’s. The Premise: Five students from our world are transported to the world of Fionavar, where they get involved in its past, present and future, in a big way. Think Lord of the Rings on a slightly smaller scale, but adding regular folk in the mix. Maybe like a more adult version of the Narnia books. Why I Really Like It: This was one of the first series of books that made you aware of the fragility of life – because the characters were expendable; people who you didn’t think would be going anywhere suddenly did, which made the story a much-less comfortable ride that some of the fantasy books I’d read at the time. I was a big fantasy-head at the time. After having read Lord of the Rings, I went out hunting for more – probably trying to recreate that ‘cherry-high’ you get when you fist discover a Big Book of Great Importance. It did mean I read some right old tat – and then I bumped into this one. It’s a weird blend of classic fantasy and grim fairy tale, bound-up with a look at how encountering this sort of thing might have an effect on ordinary people – but without all the self-loathing from the Chronicles of Thomas Covenant. The people you meet in these books are just like us; prick the surface and a whole lot comes bubbling out. Best Books: Nostalgically, I’d have to say the first – but I lapped these up as they came out. But the first, because it threw me into a world where nothing was guaranteed. It was also one of the first books that really shocked me into understanding parallels between external events and internal development. Cool stuff. Who It Will Appeal To: Fantasy-heads. If you’ve done LoTR and want something similarly filling, go for this. If you haven’t done LoTR because it looks a bit daunting, this is a great way to find your feet in the genre. Others by the Same Author: Tigana. 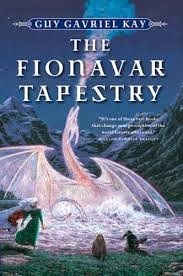 If you liked the Fionavar Tapestry, this is well worth a look – especially as your lifeline to our world has been severed; it’s unadulterated fantasy, which is a Good Thing, in my humble, Geeky opinion. Andy Robb is the author of the excellent Geekhood series. He has a website and can also be found on Twitter. Ooh! I love this idea for a feature!